Hatshepsut (Hepzibah) Maatkare (r.852-829 BC) was the daughter of Thutmose I and Queen Ahmose (meaning child of Moon). Hatshepsut was the High-Queen of Egypt, Kush, Sheba and Kedar (in the Land of Mu). She came of a long line of Moon (Mu) Queens. Thebes was called Wa-shet or Wa.she which can also be read She.Wa (Sheva or Sheba). It is near Thebes that the Great Temple of Hatshepsut is found. She married King Solomon's brother Nathan (Nehesi/ Narada) who became the Royal Governor of the Rhodan Empire (Mu) and King of Dedan and Kedar. When Nathan died childless she went to Israel to fulfil the custom of yibum (raising up a son to the name of his childless brother) with Nathan's oldest brother Solomon. They had a son Mattata (Nattata/ Narada) who was the ancestor of the Virgin Mary (Luke 3). Her daughter Neferure (Nenuna/ Netuna) with Solomon (Senmut) was reared by her in Egypt. The account of the voyage to the Land of Punt tells the tale of how King Solomon (Senmut/ Senenmut) and Prince Nathan of Israel sailed to ancient Australia (Send/ Sinim/ Ophir/ Kedar) and south east Asia (Havilah/ Hend). The ruler of these lands was called Parahu or Pharaoh which was the title borne by Shiva the grandfather of Hatshepsut. From this time the rulers of Egypt adopted the title Pharaoh (Pharan). The title for a High-Queen of Rhoda was the Ati who was Chandika (Kandake). The Northern land of Hend (Havilah) was the homeland of the cultures of India. Queen Ahmose the mother of Thutmose II and Hatshepsut was the daughter of Shiva (Parahu) and Chandika (Ati). The great city of Ophir or Saphir called the city of Gold was built at the mouth of a Great River flowing from a huge Canyon bigger than the Grand Canyon in America (another place that has been said to have been settled by Egyptian-Phoenican-Israelites). Ancient accounts spoke of the houses being on stilts and beehive shaped in a land of great Valleys or canyons. This whole area was destroyed and sunk into the sea at a later date along with much as this land of Mu (Sheba/ Punt). This Great River was in ancient times known as the Eridanus River (Red river) and the Indian Ocean was called the Eridanus or Erythean Sea. The Eridanus River was also known as Cygnus (Swan). There is an Ancient Greek myth that tells of Phaeton the son of Helios falling into the Eridanus River and his friend Cygnus mourning for him and being turned into a Swan. The Eridanus constellation is also associated with its Babylonian name of Star of Eridu. Some observers have even claimed to identify wall-like structures and a pyramid shaped object in the Perth (Swan) Canyon. The great City of Sheba may have been at the ancient mouth of the Fitzroy River. At one time there was a merchants trade route that went directly south east from Sheba to Ophir. There was a settlement at Mt Newman and even in the early days of the British settlement there was a belief that a white tribe of aboriginals lived in this area and a number of sightings of white aboriginals were reported. Going further south east there was another settlement near Walga Rock near Cue. When the climate was wetter this area was very fertile with a huge Lake now called Lake Austin. In the early days of British Settlement this area was found to have a remnant of a white tribe as the aborigines of this area were tall, fairer skinned (with a yellow tinge rather than black or copper) and some of them had blonde hair and beards. The Lake Austin settlement may have been part of the ancient inland Kingdom of Heber (its south western corner). Its major centre being at Lake Mackay. Or the Lake Austin site may have been a settlement in the Land of Ophir (in its far north eastern portion). South west from Ophir was the City of Kedar near the Gracetown/ Margaret River area of Western Australia. Others believe that a white tribe of aboriginals lived in the Karakin Lakes area just north of Perth and were transferred by the colonial government to the Irwin River area. This was linked to the famous story of the Dutch settlement and this may have been a white tribe descended from the Dutch rather than the ancient Israelite-Egyptian-Phoenician inhabitants. Governor Stirling was concerned with the discovery of these white survivors and ordered Lieutenant Dale to investigate other places of rumoured white aboriginal settlements. Lieutenant Robert Dale also followed others tales of white aboriginal settlements to Talbot River and then north-east to Lake Austin. The white aboriginals at one stage also had a settlement in the Talbot River area near Beverley and York but by the 1830's they had been either massacred or moved on by the Nyungar. It would seem Robert Dale found some remnants of this tribe of white aboriginals (who also had some black aboriginal ancestry at this stage) at Talbot River. They told him of a further white settlement to the north east of Talbot River where there was a great inland lake (or sea). 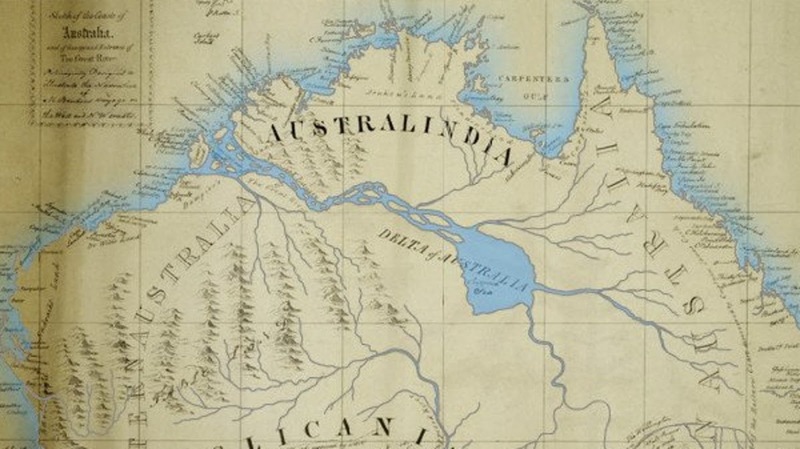 Maslen's map drawing on ancient accounts demonstrates that there may have been a huge River and water way beginning at the ancient mouth of the Fitzroy River at the King Sound. 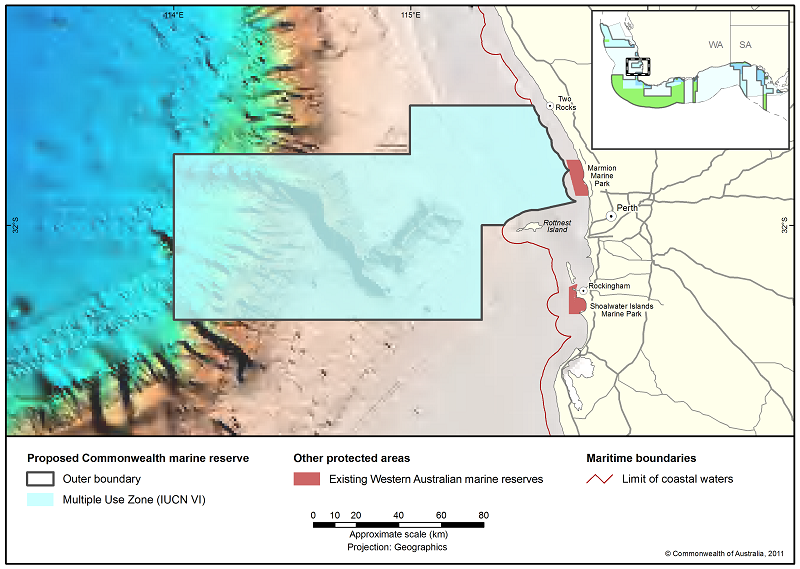 Though his map may be out of proportion as it is likely that the area of Lake Mackay was part of the inland Sea. 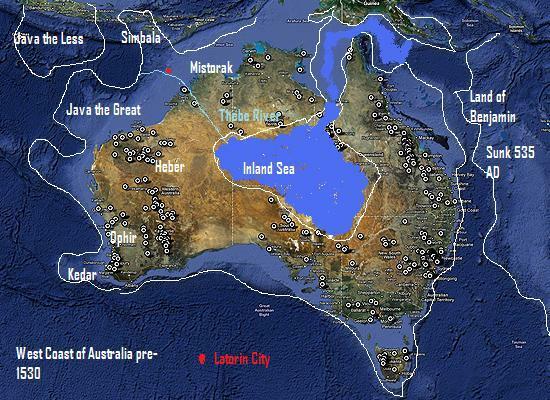 Ships could sail down the ancient River of Sheba (Thebe/ Theba) to the Capital City of the Land of Heber in the middle of Australia in the region of Lake Mackay. Lake Mackay itself was once part of the so-called Eromanga Sea that covered much of inland Australia. Maslen must have had access to an older map of Australia from before 1530 when the mouth of the Fitzroy River was a couple of hundred miles further north-west in the Timor Sea which showed this water way and Inland Lake or Sea. He then tried to fit this detail into the post-1530 shape of Australia which moved the waterway and Inland Sea (Lake Mackay) too far east. Originally before the disasters around the years 1400-1300 BC it was possible to travel to Punt by land. 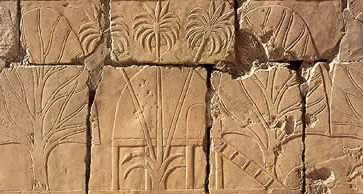 During the reign of the Josephite Dynasty of Thebes (Sheba) the land came under Egyptian rule. However the Ancient Ethiopian Book of "The Conflict of Adam and Eve" tells us that Sheba was ruled by a long line of 60 Queens until the time of Solomon. This line of Queens began with Milkam or Milka the first High Queen of Eridu (Rhoda/ Ares/ Mars/ Marutz) whose mother was the Prophetess Yiskah the Priestess of the Rose (Shoshan). The Hebrew word for Queen is Malcah that derives from this word. The story of Nehesi (Nathan) (aged 17), Senmut (Solomon)(aged 23) and Thutiy (Thutmose II) going to Punt together is not in the ninth year of Hatshepsut's reign- this may be the year she is relating the story on her Temple at Thebes. Or more likely it is telling how when she was 9 years old in 863 BC she travelled with King Solomon and his younger brother Prince Nathan and her half-brother Prince Thutiy (Thutmose II) to the Land of Punt to visit her grandparents. Hatshepsut (Hephzibah) remained in Punt (Ophir) where she married Prince Nathan who became the Royal Governor of Kedar at first under the authority of the Paruhu (Pharaoh) known as Shiva (Sheba) and Rudra (Rhoda) [after the places that he ruled but also called Mahadeva and Para Matman (Mattata)] and the High Queen (Ati) Chandika. Solomon returned to Jerusalem from the Southern continent. He arrived back in about 860 BC. Around 857 BC Nathan died and Hatshepsut (Hephzibah) came from the ends of the earth in Western Australia to visit King Solomon and to fulfil the law of yibum. Hatshepsut then moved to Egypt where she had two children to Solomon. Damien Mackey believes that Solomon (Senenmut) was in Egypt during the 7th, 9th and 16th years of Hatshepsut's reign. Modern Scientists have discovered the richness of natural life of the area they call Sunda or Sundaland. This is also seen as the homeland of the ancient Hindu (Hend) culture and religion. There is even an "Out of Sundaland" population theory. However the ridiculous datings of the evolution theorists distort the evidence. We know that Velikovsky mentions that the population of the Land of Punt which we link to Mu was Caucasian (Mu/ Milesians / Meshwesh) with also black people (Kushites). Ancient sources link this area of Ophir with Reu the ancestor of Abraham from which the name of Pa Reu (Pharaoh) or House of Reu developed. 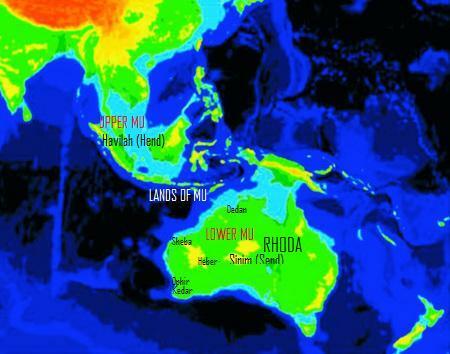 In the time of Reu and Job the Ice age hit the Northern Hemisphere and drove the population South into the Lands of Mu. The Ice Age hit about 200 years after the Flood due to the cooling of the Oceans and reached its maximum over a 100 to 150 year period when the human population headed South. They established an advanced civilisation in the Southern lands (Sundaland) and it was from this Eastern homeland known as Sephar a mountainous region that the Kushites and some of the Hebrews first settled in Mesapotamia. The Ice Age in Europe continued until about 1500 BC. Punt is also the original homeland of the ancient Phoenicians and Hebrews. During the time of the Josephite Dynasties of Egypt many of the Israelites resettled in the southern lands of Mu under the leadership of the Zerah-Judaites and the Manasseh and Ephraim Josephites before the Exodus. The Josephite Theban Royal family, the Phoenician Hiramites and the Davidic Kings reestablished contact with Mu. When the Assyrians took the Israelites into captivity many of them were placed in the North and from there they moved into Europe around 500-400 BC. However another large group of Israelites and Judaites were placed in the South east of the Assyrian Empire in the "mountains of Media". These southern Israelites who followed a paganised version of the Hebrew faith left the Assyrian Empire and fled east heading for the Egyptian-Hebrew-Phoenician colonies in the Southern continent. 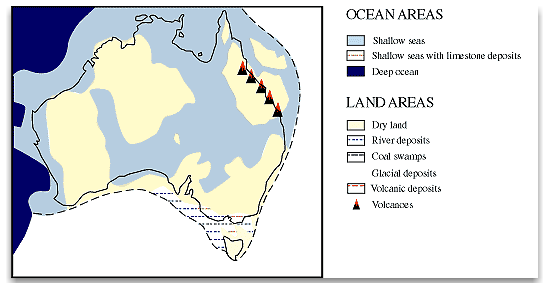 The Sabbaton was the volcanic strait that separated Australia from Asia. While much of northern Mu had already gone under the water Ophir and the cities in the south still existed even though the continent may have already been starting to dry up and become more desert-like. Scientists from the University of Western Australia claimed that the Swan River once carried a huge volume of water and that the weather in the past was much wetter. It would seem that some of the coastline of Western Australia may have fallen into the Ocean around 540 AD when a huge heavenly object struck Northern Australia and created the Dark Ages in Europe. It would seem that the Neleus (Nilius/ Nimlot/ Eliezer) who founded the city of Miletus around 600 BC was from Mu . He is called a son of Kodros who is meant to be the last king of Athens. In reality Kodros refers to Kedar in the southern continent from where he came to Egypt and then Greece. His father was the King or Prince Jorim of Kedar. It is on the ships of the Milesians that many of the R1b Israelites would move from Mu to Libya and Western Egypt. His descendant was the Milesian Chief Prince of Mu in Egypt called Elmadmam or Shoshenk (Shashank). Shashank is a Sanskrit word meaning "moon" and both Mu and Libu mean 'moon'. His son Osorkon (Socho) was also called Cosam who was the father of Nathaniah (Elnathan/ Nathaniel) and Takelot I Addi. Nathaniah settled in Jerusalem in the reign of King Josiah and embraced Judaism. His daughter Nehushta married Josiah's son King Jehoiakim and she was the Queen-Mother of Judah when her son Jeconiah briefly ascended the throne. Queen Nehushta was taken by Nebuchanezzar to Babylon with her son. However she seems to have escaped or left Babylon and gone to Egypt and married her cousin Osorkon II Chief Prince of Mu (Milesians/ Prince of Thebes) in Egypt. This second Osorkon was also called Melchi or Milad. King Jeconiah after 37 years in a Babylonian prison was released and set on his own throne as a King or Exilarch over the Jews of the East.